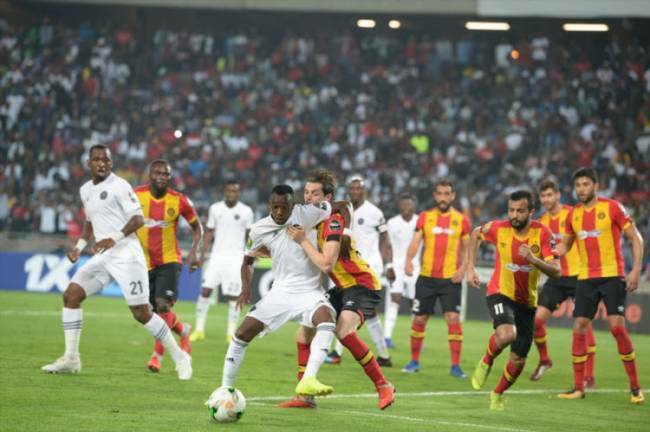 After a heated match up in Soweto just a fortnight ago, Orlando Pirates will on Tuesday lock horns with reigning African champions, Esperance at the El Menzah Stadium in Tunis. The two African giants played out to a highly tactical goalless draw at the Orlando Stadium in a match that Pirates felt they were unlucky not to collect maximum points. The Buccaneers headed to the Soweto Derby against rivals Kaizer Chiefs, with their travelling bags packed and ready to immediately jet off to Tunisia after the derby, which ended in a 1-1 draw following Thembinkosi Lorch’s equalizer towards the end. Esperance will welcome Pirates in a top of Group B clash with both sides on five points from their three respective matches. While Esperance will enjoy home advantage and hold the favourites tag to their name, the Buccanneers will be looking at finishing off what they started in Orlando. Even a draw away against the reigning African champions would be a fairly good result for the group B leaders who have done well so far in their quest to reclaim their continental glory, which they last celebrate in 1995. Speaking ahead of their trip to Tunisia, Pirates coach, Milutin ‘Micho’ Sredojevic said the team needed no motivation playing against a quality side like Esperance and the previous result demonstrates that their opposition can be matched. “Instead of thinking about things behind us, we need to rather think of what is ahead,” said Sredojevic in reference to their impressive display in the 0-0 draw against Esperance at home. “We are fully aware that we are playing African Champions away in conditions we are not familiar with. Bearing in mind we are representing South Africa, we shall inject motivation to get the best possible result. It won’t be easy, but we definitely want to give it our best shot like we always do” said Micho. A huge plus for the visitors will be the fact that they won’t have to play in front of the hostile fans of the Blood and Gold with the match being played behind closed doors. On the other hand, a slight headache for Micho would be who to give the nod to in the goals with none of the Pirates keepers yet to make the goalkeeping position their own. The Buccaneers had Wayne Sandilands in the sticks this past weekend against Chiefs who isn’t available for selection while Brilliant Khuzwayo is yet to regain his full fitness from injury. This leaves Jackson Mabokgwane and Siyabonga Mpontshane as the only two options for the side with both keepers yet to find consistency in the Bucs jersey.